Spring into Summer is my favorite time of year. With my small garden planted I'm looking forward to eating VERY locally from the backyard in the coming months. Zucchini have started; cucumbers, tomatoes and peppers are not far behind. About as local as it gets. The vegetables I grow simply taste SO MUCH BETTER! Over the years (TEN now, and WOW!) more than one person has asked if I could make tea bags. They go on to explain they use the 'original' More than a NUT MILK BAG for large batches of tea and would love to have a smaller version for their morning cup of loose leaf teas or herbal infusions. After some testing we found that the finer weave netting we use for our SUPERFINE More than a Nut Milk Bags works perfectly for powdery tea and herbal leaves. So, the Rawsome Creations More than a TEA Bag is now available. Our Tea Bags come in a pack of three, and can be used for so many of your smaller kitchen tasks. Teas and infusions, bouquets garnis and sachets, and so much more. Click to the shopping page, where they're now on sale at a special introductory price. And be sure to let me know what you think! It was a very busy spring with what I call Summit Season. Everywhere I look, someone is holding a summit ...on Veggies, Juice Fasting, Mastering Diabetes, Food Revolution . . . The Fasting Summit, The Veggie Shift, and the Plant Based Transformation Summit. Phew! * I know there's a big chain of megamarts, Holy Foods, or something, owned by an even bigger marketing juggernaut. But in this case, we aren't going to let them co-opt that good word "whole," are we? By WFPB (Whole Food Plant Based) we put emphasis on preparing meals that contain intact plants, not products derived from them: olives and avocados instead of their derived (and processed) oils, potatoes rather than frozen (processed) French Fries, a handful of fresh almonds instead of almond flour cookies. I am delighted to see more experts tumbling to the corrosive effects of the Standard American Diet (SAD!) and urging us toward nutrition with abundant plant-based options. There is now wide agreement about the efficacy of a majority whole food plant based* way of fueling professional athletes, luminaries, health professionals ...and you and (especially!) me. I am always thrilled to see new approaches, and having my hunches confirmed by the experts is deeply satisfying. One of my favorite speakers, Dr Neal Barnhard, founder of Physicians Committee for Responsible Medicine (PCRM) recently released the first App available to Doctors and Clinicians to use in recommending special WFPB diet choices to their patients battling disease. In addition, he's leading a new group, the True Health Initiative (THI). In particular, I want to draw your attention to his holistic "Solution" on this website, incorporating a healthier approach to food and so much more. Get 'em while they're young! University of North Texas (Denton, Texas) is the first college in the country to offer an all vegan dining hall, and David Davidson, Managing Director of Harvard University Dining Services (serving 27,000 meals a day) is working to make meals more "plant forward." He writes, "We're slowly going to change people's minds about what they should be eating." Chef AJ is a favorite plant based chef and she loves acronyms almost as much as I do. I enjoyed her talk and discussion of the SOFAS diet. It's not what you think, but the message is clear. We all could be more mindful of S sugar, O oil, F flour, A alcohol, S salt in our daily food choices. Brenda Davis, a Registered Dietician and well known author of several veggie friendly books, discussed her Whole Grain hierarchy (whole grains, cut, rolled, shredded, ground, flaked, puffed). I hadn't connected the dots until she helped me think it through: the more surface area the grain has (more processed), the faster it's absorbed, leading to a harsher effect on blood sugar levels, higher glycemic impact and oxidation, and more nutrients compromised. My take-away: Go for intact whole grains as often as I can. A NY Times article sheds some light on the food industry's dark side: in an article "The extraordinary Science of Junk Food". Major food company players go to absurd lengths for 'food optimization' in the hopes they'll provide public food that hits our 'bliss point' and generates 'craveability.' (Sounds a lot like drug pushing to me!) The article gives us a comprehensive historical narrative of the evolution of packaged foods. We already suspected there were scary things going on in those massive processing factories, and here's the proof. A long article, but worth the time because it validates the efforts we WFPB foodies have been making, and supports eating as fresh, locally grown, and pesticide-free as we can while ditching the cans, bottles, boxes, and packages. Fresh veggies Rule! Michael Pollan, one of our favorite voices of sanity offers this memorable advice: "Eat food. Not too much. Mostly plants." The subject of juicing has never been more popular than now. There are SO many types of juices available at your local grocery store ... but beware and read labels. Store-bought juices are typically chock full of added sugars, salt, and preservatives. I always look for the nutritional information to see what's the truth behind the label. The marketing on the front — "all natural, gluten free!" — often stretches the truth about what's really inside. Only a few offer healthy ingredients to fuel your day. First thing in the morning, I love a good juice and when I'm home, I make my own. 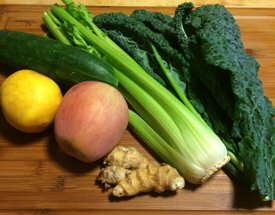 It's always best to use a slow juicer, to retain as much nutrition as possible. 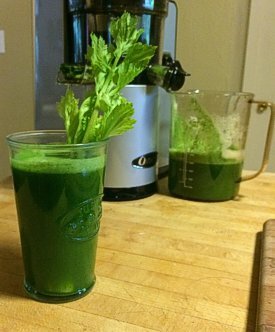 My all-time favorite juice recipe, Green Giant, is still my 'go-to' and gives me loads of fuel to start my day. With basic ingredients of Kale, Cucumber, Celery, Ginger, Apple, and Lemon, the flavor balance is so good that even Mike, perceiving the benefits, happily joins me in my morning ritual. Heart warming to see family and friends embarking on a healthily plant based road to health! In an ever-changing retail marketplace, companies like mine, that are fortunate to have sustained a long life, going on 11 years now, rely on a healthy audience of folks like you, and I thank you. You customers are the best! Thank you for continuing to ask for Rawsome Creations nut milk bags by name in your local stores. If your store doesn't yet have them just let me know and I'll make a call to see if that can be remedied. 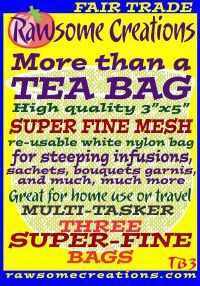 And try a packet of our new More than a TEA Bag at our special introductory price! Thank you for your continued support of our products and projects. Real people benefit from your purchase and we couldn't be happier to share the wealth.